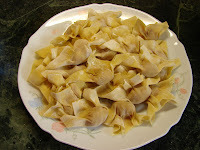 Wontons are quick and easy snack for a lot of Chinese. 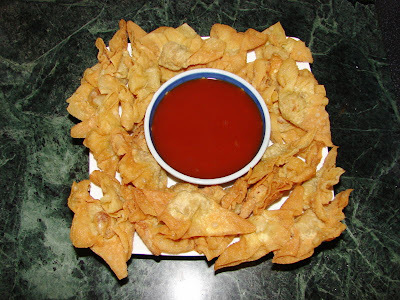 I haven't met anyone who doesn't like wontons. I like them deep fried or boiled as dumplings with a spicy sauce Szechuan style, with a Cantonese style sauce or in soup with or without noodles. You can make your own pastry if you have a pasta machine, but it is so much easier to buy from Chinese supermarket, chilled or frozen. 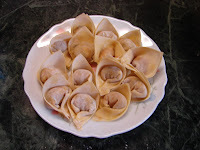 Cantonese wonton pastry is usually yellow in colour while Shanghai or Szechuan wonton skin is usually creamy white, and wonton skin is always cut in square not round. There are various ways, the most common is these two. 1. Fold diagonally into a triangle then with both hands squeeze the pasty toward the centre, pleating and sealing it at the same time. See slide show . I like this method for deep frying. 2. Fold diagonally again, press the pastry gently right outside where the meat filling is, then pull both pointed ends of the folded side downward and to meet each other, wet the inside of the jointed ends, press and seal. See slide show. I like this method for wonton soup. I had some wonton and noodles soup yesterday with some left over meat filling from the stuffed cucumber. Good stock is important don't use instant stock cube, boil some chicken or pork bones and flavoured with some salt, dash of light soy and some ground pepper. Many chinese like to add a little of Knorr chicken stock granules to make the soup base more tasty. Wonton and noodles soup is always very basic just good soup base, fresh chilled cantonese noodles from the chinese supermarket, wontons and some chinese green (cook with the soup base or boil with noodles till tender) with a sprinkling of pepper and maybe few drops of sesame oil or garlic oil before serving. 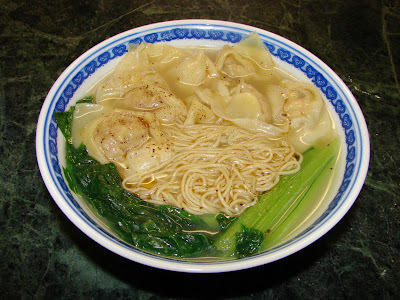 Always boil the noodles separately in a large pan of boiling water, never boil with the soup, only takes about a minute, same with wontons if they float they are cooked. To go with the noodle soup I had deep fried wontons with S&S sauce. My favourite snack or finger food. For the filling just seasoned pork or 50:50 pork and prawn, don't add any vegetable or spring onion, vegetable will make the pastry soggy. For the S&S sauce, no colouring like in takeaways or restaurant, just plenty of tomato ketcup, dash of favourite chilli sauce, dash of oyster sauce or light soy sauce, sugar to taste, about 3 times water to dilute, some cornflour to thicken and dash of sesame oil for a nice flavour. If you like the sauce tangy, add few tbsp of lemon or lime juice at the end of the cooking. For the wontons deep fried in about 1 cup of oil in several batches, for about 3 minutes till golden brown and crispy. Do not heat the oil too hot, if the pastry sizzle that is ok, if too hot the pastry will burn in seconds and the meat will not get cooked. Thank you for your lovely recipes and very good pictures! They are full of useful advice even on the little things that can sometimes be important. Love your description of the pastry making for the puffs. Makes me want to try them, even though they look very time consuming.